That is such a great skirt! I just love Forever21. Forever 21 has been coming out with some great pieces lately! this skirt is so unique and pretty. What a beautiful piece. What a classy and chic outfit! Love it! They are really knocking it out of the park this year! I've gotten a lot of great pieces from Forever too. This look is perfectly polished and so chic! Great skirt! Love your whole look! Your coat is really quite amazing. The drape. The folds. That colour. That skirt is really pretty and your rings are, too! The semi-sheer blouse goes great with the skirt. I need to check out this line from F21! Rachael, you look fabulous. I still can't believe that Christmas is just around the corner. 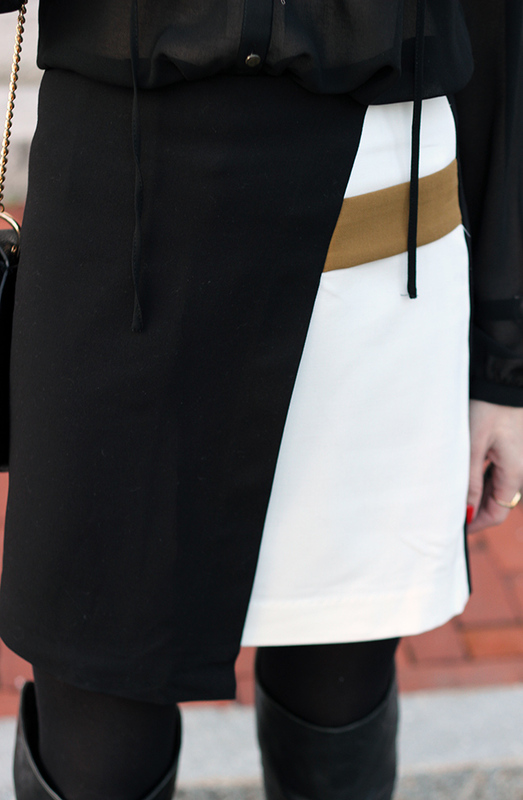 How fun is that color blocked skirt?! 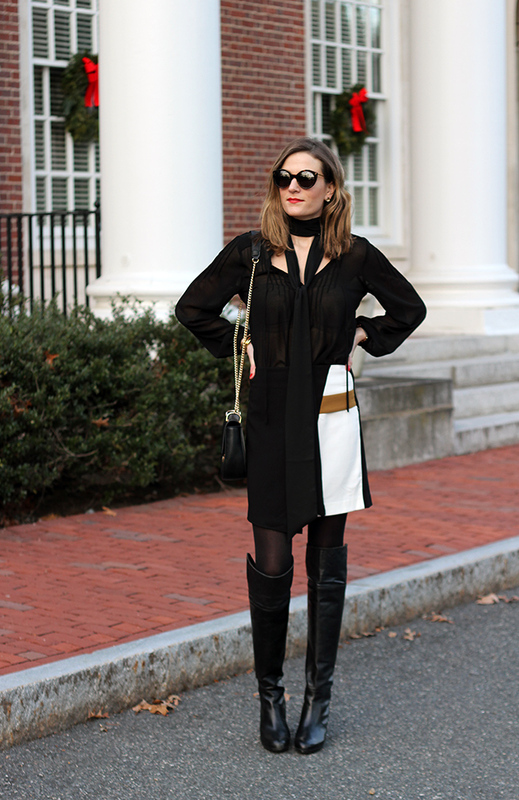 Love the black and white and I cannot get over those boots! that skirt is perfection! You look so chic! Such a fun and unique skirt, I love it! you look so chic I love your coat and your boots! I really like the way this entire look came together. What a great look, I will have to check out this line out. Thank you for being a part of TBT Fashion link up and had a wonderful Christmas. See you in 2016! That skirt is beautiful. It looks so expensive and well-made. I will look for it at the store, the problem is with F21 things they always go by way too fast or not all the same stores carry the same stuff. 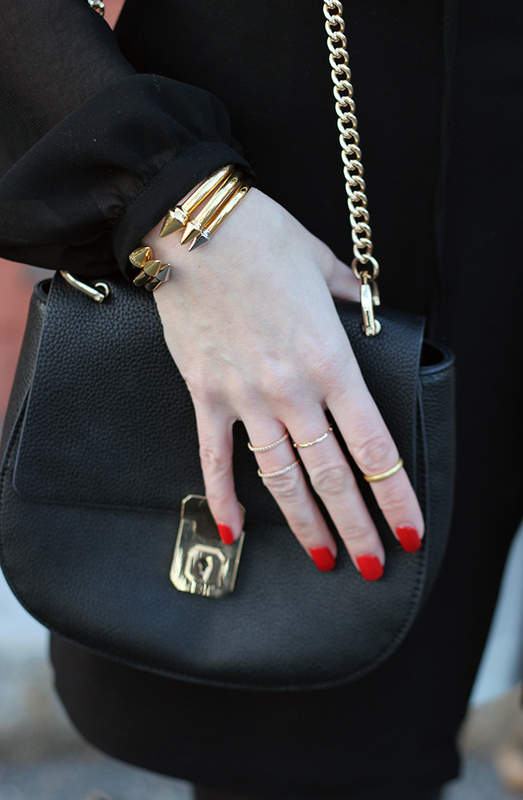 I love it paired with black and camel for a monochromatic look. Hope you and your guys had a wonderful Hannukah and Christmas! i love those boots! super cute outfit.